Born and raised in the Punjab region of India. 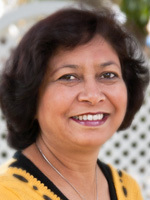 She worked as an educator for 20 years before immigrating to the United States, where she has worked with elders and mental health issues with in Punjabi community of Livingston. Dolly is currently attending college and working as a teacher assistant for an after-school program. She wants to help new Indian immigrants to be able to exercise their culture and have space to pass on their cultural knowledge and artistic craft to the new generation. Dolly was a Tamejavi fellow during the pilot phase of the program, and she hopes returning for a second round will allow her to continue the work she started to address gender inequalities, social isolation and other issues affecting her community. She has demonstrated persistence and the ability to bring people, particularly women, from her community together.